hmm... you can google it out "Happy = feeling or showing pleasure or contentment." But how you feel real happy? A Happy people will always show you a bright smile. I admit i am one of them, i love to smile, love to smile from my heart when i feel happy. 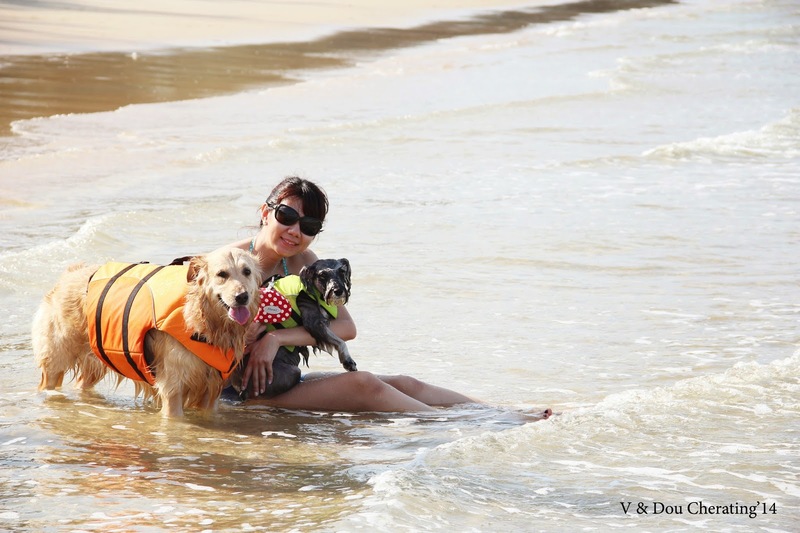 My most memorable story which i can see i am with a bright smile in 90 pieces pictures out of 100 is getaway with my furkids. We have annual trip for our furry princesses every year, and went to the same place because there are not too much of places where is pets friendly. We had a lots of fun there, of course when dogs off leash, they feel the freedom and excitement, that's what i love to bring them out for vacation at least once in a year. As usual, we stayed at Ruby's resort for this 3 days 2 nights trip. Yeah, we extended one more night ( we went for 2D1N last year and the year before) to have more fun and more relaxing, i am the driver (drove them all the way from Kajang to Cherating ) , nanny ( to make sure dogs and humans are comfortable with their stay and food), groomer ( shower and dry my princesses every time after beach), maid (bring my princesses go wee wee and poo poo, bring humans go to eat, make sure our room is clean enough after dry them) , i am extremely exhausted. When we reached, that is 3pm, and after checked in and get to the beach is around 5pm, so the light of shooting picture is darker. The weather of May is quite terrible, thunderstorm in every day. I was very worried to pick a good date because golden Dou Dou is super duper scare of thunder and raining! she will lost control and damage something may be when she is looking somewhere can hide. Too bad that the thunderstorm came in the first night, that is more worst and horrible! There are no building surrounding us so you can heard thunder louder x2! The worst part is when thunderstorm came, power failure in our room. Golden Dou Dou was like " arghhhh!!!!" gone case ==! she can't sleep so meaning that i can't sleep too, haiz... luckily we are not going back the next day, i have no more energy to drive 3 hours. "Dog is the only thing on earth that loves you more than he loves himself" , how could i not happy with them?! Please spend time with your dog if you have, own them and please love them! A smile can brighten the darkest day, so just SMILE!